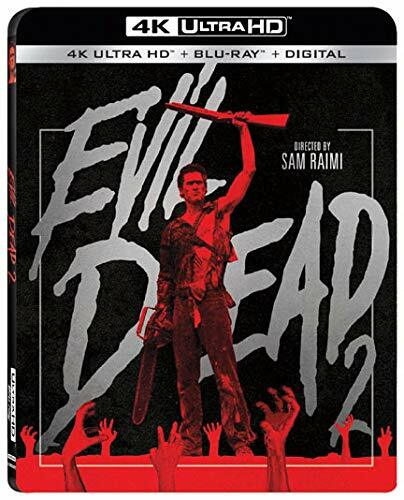 Sam Raimi’s now-classic horror film Evil Dead 2 (1987) is releasing to Ultra HD Blu-ray Disc on Tuesday, Dec. 11. The 4k edition follows The Evil Dead (1981) on UHD BD last October, and both editions feature 2160p resolution with High Dynamic Range using the Dolby Vision spec for deeper color depth. English audio is provided in DTS-HD Master Audio 5.1, as well as French in DTS-HD Master Audio 5.1, Spanish in DTS-HD Master Audio 2.0, and German in DTS-HD 2.0 Mono. Subtitles are provided in English, Spanish, German, and English SDH. Bonus features include several featurettes (detailed below), audio commentary from writer-director Sam Raimi, actor Bruce Campbell and others, theatrical trailer and still galleries. The two-disc combo from Lionsgate Home Entertainment includes a Blu-ray and Digital Copy and retails for $22.99. Amazon is taking pre-orders for $17.96.